"An unusual shaped Spode Staffordshire Blue and White Greek pattern pearlware pottery dish. A fine example of Spode's Greek or Etruscan pattern. The quality, definition and detail of the Spode factory transfer printing is a particular feature and as good as any you will see. It looks wonderful on display with other fine antiques and will enhance any best collection of fine English pottery. Those in the know will know that this unusual shaped dish is in fact a flat dessert comport... The very best of antique blue and white transferware from Spode for the connoisseur collector." Antiques Expert Hamilton Bear. 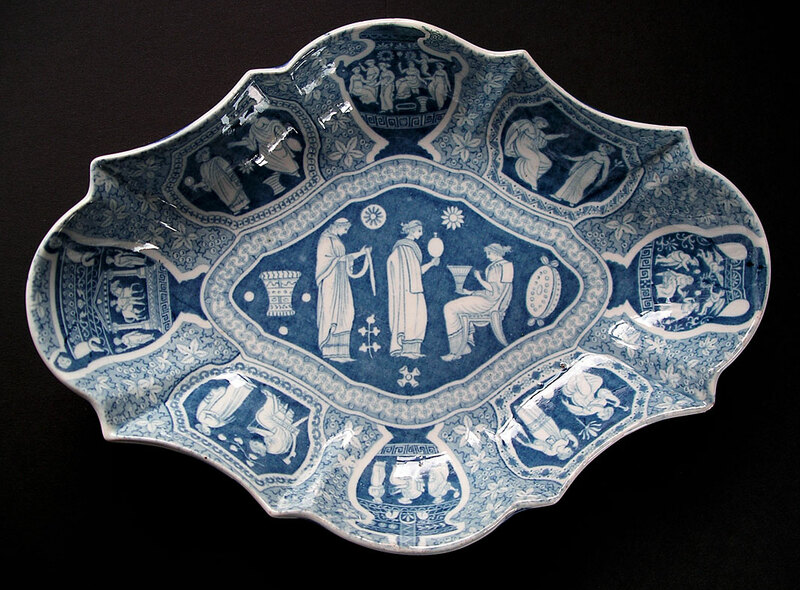 References: For another example of the Spode Greek pattern see Blue and White Transfer Ware 1780-1840 A.W. Coysh plate 115 page 83. This pattern probably corresponds to the "Etruscan" pattern referred to by Jewitt in his contemporary account of Staffordshire ceramics. The designs are based on published engravings by Thomas Kirk (1805) of the collection of Greek Roman and Etruscan vases owned by Sir William Hamilton. Dimensions: length 252 mm max. width 182 mm max. depth 50 mm max. Marks: Spode workman's mark in blue to back. No other marks which is not unusual for examples of this pattern. Condition: In very good decorative condition with only signs of very light use. There is typical light crazing to glaze which is not discoloured and does not detract. At some point a flat rim chip at the dish edge front at 12.00 o'clock has been professionally filled and painted to a good standard. This is not immediately obvious but is visible on close scrutiny. It does not spoil the display qualities of this rare shaped example of one of Spode's most desirable patterns.